This piece was created for my (then) eight year old son, Ryland. We discussed several ideas for the image that he would want on his own jacket, but most of them were cartoons or had something to do with Yugi-Oh, and I just couldn't imagine any of them having the lasting appeal appropriate for something this durable. Choosing the picture to be embroidered is a lot like deciding on a tattoo. Would he really want to be walking around with Spongebob Squarepants on his back when he's 16? Then we hit upon Harry Potter. Rarely has a book been written that has the multi-generational appeal and literary quality of the Harry Potter series, and the artwork apparent in all the marketing is equally appealing. 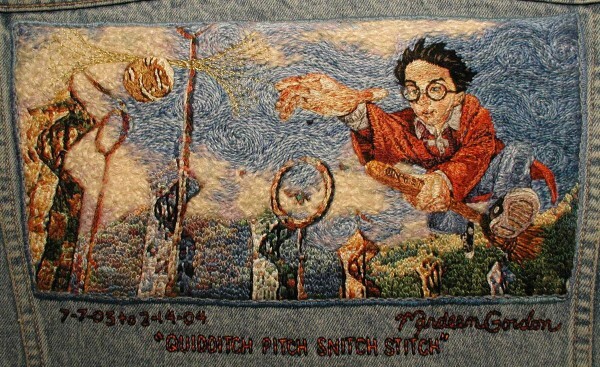 We are both really intrigued with the idea of the game Quidditch, which is played while flying around on broomsticks, and I figured it would be easy to find an image of Harry catching the snitch on the Quidditch pitch. After several hours of internet searching and perusing the HP merchandise, however, I found myself frustrated. I really like the book cover art and chapter illustrations by Mary Grandpre, but to my surprise, neither she nor any other artist I could find had created the scene I was looking for. The closest I could find was an unattributed colored pencil drawing of Harry from the cover of a journal my son bought through Scholastic Books. To get the background of the Quidditch pitch, I paused a scene from the first movie on DVD and took a digital photo of the TV screen. The closeup of the snitch came from a different paused movie scene. I scanned the journal cover, cut and pasted Harry and the snitch onto the pitch, played around with artistic filters and color intensity in Adobe Photoshop, and voila! I have the image I had pictured in my mind. This is my first embroidery art which is not a direct copy of another artist's work. This is also the first to utilize a different textile media than standard embroidery floss, using a fine mohair yarn to capture the fluffy texture of the clouds. The image is 6"x12", and was completed in only 214.5 hours over a 7 month period from 7-7-03 to 2-14-04, the shortest time yet. Ryland is thrilled to have his own special jacket to wear.